Stuck for what to get your kids for Christmas this year? Do they already have the latest gadgets and ‘must have’s’? Or maybe money’s a bit tight and you need to find something great for not a lot of cash. Last Christmas I didn’t have a clue what to give my teen and tween boys. When they were younger it was so easy to buy lots of small stuff plus one big ‘star’ gift. It gave them the excitement of seeing a load of prezzies under the tree and the fun of unwrapping them all. But what do you get older kids who’ve outgrown toys, have plenty of games and certainly don’t need any more gadgets? I put my thinking cap on and came up with an idea…. I wasn’t 100% sure if it would go down well, but I had a pretty good feeling about it. Christmas experience vouchers they could redeem for a whole variety of things! I can’t begin to describe how excited they both were as they unwrapped each one on Christmas morning! At the end of the day, most kids would rather have quality time with you than anything else. Here’s how to pimp my idea and create vouchers like these. 2. Hover over the ‘design’ option and you get a drop down of choices. Choose ‘custom’. I made mine 755×377 pixels. 3. Now you’ll see your blank canvas. On the far left click on the ‘new’ snowflake then choose ‘Santa Land’ theme. 4. Scroll down to Frames and choose Candy Land Frame. Here you can choose colours and thickness of your frame border. I also chose the 3D effect option. Click ‘apply’. 5. Now you want to add your text. There are some Santa Scripts to choose from, but I went out of Santa Land to choose from the regular text options in the left column – Tt. I used the Lobster Two font. Make separate text boxes and re-size, change colours. 6. Now you can add some cute little extras like gingerbread men, stockings, candy canes and holly. Go back to the Santa Land and Winterland themes to add these. 7. Save your creation! Click ‘save’ at the very top, name your file and choose Pierce quality. Save to your computer – then print to make sure you’re happy with it before you make more. What do you think about making experience vouchers this year – and what kinds of things you think your kids would love? My gift for YOU this holiday is this two-page MY DREAM DECEMBER worksheet! Fill in the blanks and get real clarity over how you want to feel and be (and what needs to get done) this month so you can have your BEST December yet. Ha ha! Yes Catarina, it’s definitely one to store in your back pocket for when he’s much older! When they’re little they just want presents and to be honest, because I NEVER buy my kids anything unless it’s their birthday or Christmas, it means I used to have endless ideas stored up throughout the year for gifts. (Books, games, puzzles, DVDs, toys…) It’s only now that they’re older that I’m finally stuck for ideas. Kelly, what a brilliant idea! I love how thoughtful these gifts are, and I honestly do believe that one of the greatest gifts you can give your kids, especially in a large family, is your dedicated time. This is a great way of making sure this happens. Choosing the outfit idea cracked me up!! Please do it – and send photos!!! Once you put your thinking cap on – and grab a notebook to capture any ideas, it’ll come to you Kara! A board game of their choice? A backrub with oils and soothing music by candlelight? A bubble bath with you? A Friday night disco – everyone gets dressed up, flashing lights, music, party food? Movie night with popcorn any movie THEY choose with no grumbling from you! A bike ride – just the two of you? Breakfast in bed? Great ideas! Thanks. I’m just finishing them now. We added cooking with Dad and baking with Mom. Dinner of her choice. A movie night. Love the disco night idea. Adding that for my last one. I’m SO HAPPY I saw this just now on the Facebook page of Dr. Laura Markham of Aha! Parenting! I’ve been wracking my brain trying to think of what to get my nieces and nephew for Christmas. I know they would love a date with me. I will have a fun day out with each of them. I am so excited and want to thank you for explaining so well how to make them like you did. They look so nice! I’m so happy you found this via Dr. Laura. She’s amazing and I’m thrilled she’s shared this with her audience. I love this idea Kelly! Besides the fact it’s a wonderful way to connect with our children it’s also a very clutter-free way of giving a heart-felt gift to someone. And you know I love that!! The gifts were loved just a much as the presents they got from Santa a success! I thought about doing these last year when you first posted this but wasn’t organised enough so ran out of time but when I you reposted it this year I just knew I had to make time to do these vouchers for my Masters 9 & 7 !! 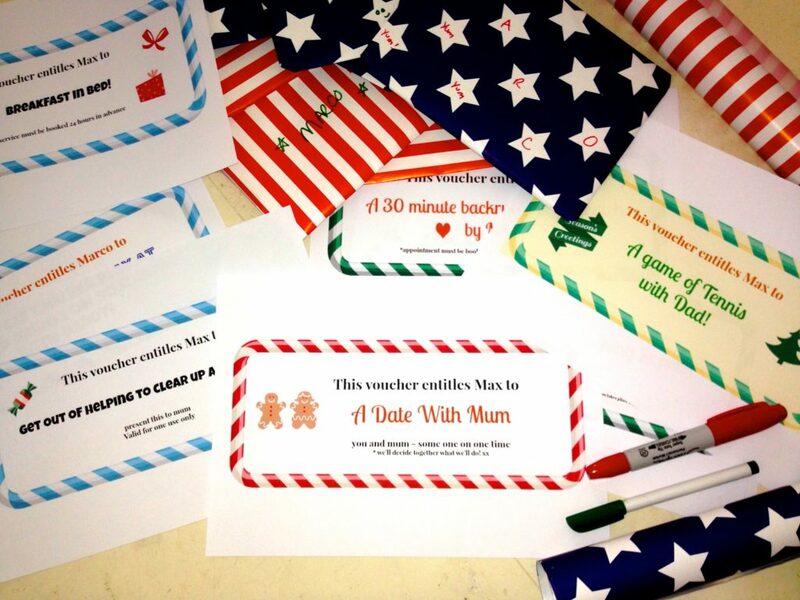 I’ve just finished creating & printing my son’s vouchers & carefully hidden them so they won’t find them. I’ll let you know how they like them 🙂 Thank you for the wonderful inspiration, I think this is the gift I’m most excited to see them open ! !